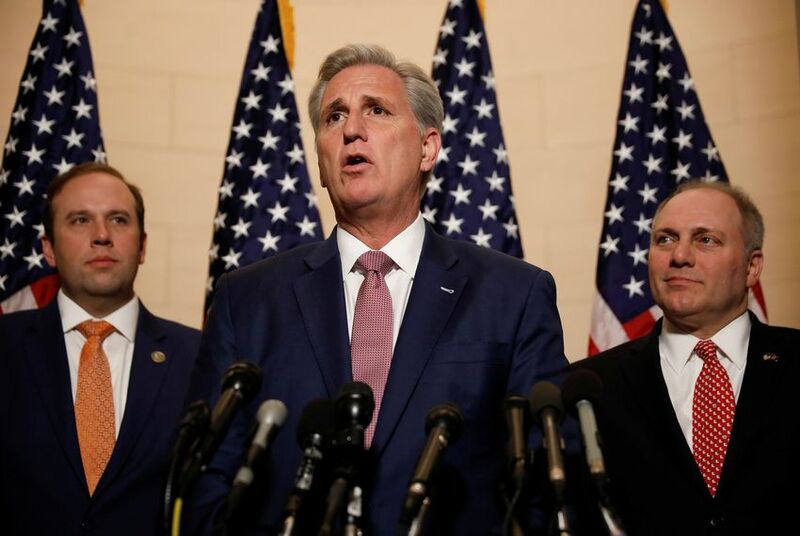 WASHINGTON — U.S. House Republicans voted U.S. Rep. Kevin McCarthy of California to be their minority leader for the next Congress on Wednesday, replacing outgoing House Speaker Paul Ryan of Wisconsin as leader of the chamber's Republicans. McCarthy, the current U.S. House majority leader, defeated U.S. Rep. Jim Jordan of Ohio, a former chairman of the hard-line conservative House Freedom Caucus, in a secret ballot vote, 159-43. Members of the Texas delegation split their votes between the two nominees. Before U.S. Rep. Jodey Arrington of Lubbock entered the caucus meeting Wednesday, he told the Tribune that he was “leaning” toward McCarthy but wanted to hear their final speeches. Arrington said after that he ended up backing the majority leader. Arrington also said that another big factor in his vote was that McCarthy has the fundraising skills the party needs moving forward, especially after being outraised in the recent election cycle. McCarthy was first elected to the House in 2006. After the chamber flipped back to GOP control in the 2010 elections, he became majority whip. When Ryan replaced John Boehner of Ohio as House speaker, McCarthy became majority leader. U.S. Rep. Bill Flores, R-Bryan, also said he voted for McCarthy. U.S. Rep. Roger Williams of Austin declined to say how he voted because “both of them are good buddies of mine.” But Williams said that the next Republican leader needed to help the GOP in “selling” their policies. U.S. Rep. Louie Gohmert of Tyler backed Jordan, saying that the GOP leadership needed a change. “We need a change of pace to go the other direction,” Gohmert said. Gohmert was not the only Texas Republican to vote for Jordan. Of several newly elected Texas Republicans joining the delegation, at least two — Chip Roy and Ron Wright — told the Tribune that they supported Jordan. Roy seconded the motion to nominate Jordan as minority leader put forward by the Freedom Caucus' chairman, Mark Meadows of North Carolina. But their fellow incoming freshman, U.S. Rep.-elect Dan Crenshaw said he voted for McCarthy. As the House flips to Democratic control in January, the GOP-majority Texas delegation is poised to lose a significant amount of clout. That loss will be felt most significantly with the loss of seven committee chairmanships, which includes some retiring members and House Rules Committee Chairman Pete Sessions, R-Dallas, who lost re-election. With their party out of power, the remaining chairmen are set to become ranking members on their respective committees. U.S. Rep. Pete Olson, a Sugar Land Republican who said he voted for McCarthy, wasn’t too concerned about the lack of Texas Republicans in high roles. Flores said the power loss “bothers” him but he wasn't too concerned because many of those committee chairs are remaining in Congress.